Scottish athletics has often been enriched by the presence of Irish runners. During the dark years of the 1920’s and 1930’s many Irishmen came to Scotland looking for or following the work that was available. For instance a large group came to Clydebank to work on The Empress of Britain and stayed on, or left and came back to help build Job Number 534 (The Queen Mary). Many signed up with Clydesdale Harriers with the best being Hans Noble, who ran for Ireland in the International Championships in Wales in 1933. He was to return after the war and become the first official coach in the club – in common with other clubs pre-war, his predecessors in the role were designated ‘trainers’. However, the one who made the biggest impact in the country was almost certainly John Joe Barry. When in Scotland, he ran for the small St Machan’s AC based in Lennoxtown under the Campsie Fells and he would go on set world records and win many championships and become one of Ireland’s best ever runners. He was born in the United States, in Joliet, Illinois on October 5th 1925. After leaving school he joined his local club, Ballincurry AC when he was 19 and for the remainder of his running career he was known as The Ballincurry Hare – and that nickname became the title of his autobiography published in 1986 but now, sadly out of print. While with Ballincurry AC, he won the Irish cross-country title plus the track mile and four miles championships in 1945. After joining the Civil Service Harriers, he he won the half mile and mile championships in 1946 and in 1947 he ran an Irish record for the mile of 4:15.2 breaking the 4:15.6 set by Tommy Conneff in 1895 which was a world record at the time. In 1948 he won the half mile and mile titles again running in the colours of Clonliffe Harriers. In 1949 he won the SAAA three miles and also the AAA three miles. When he won the 1950 American indoor mile title he held simultaneously the Irish, Scottish, English and American mile titles. He had gone to America to attend Villanova University, the first of many Irishmen to do so. He graduated in commerce and finance in 1954 following which he spent most of his business career in the States. After he retired he returned to live the rest of his time in Dublin, where he died in December 1994. His personal best times were: 1500 – 3:51.4 (1949); Mile – 4:08.6 (1949); 2 miles – 8:59.0 (1949); 3 miles – 13:56.2 (1949); 5000 – unknown. In the Glasgow Police Sports at Hampden on 11th June, Barry took on Fred Wilt of the Unites States in a special two miles race in which both men ran from scratch in a handicap event. The ‘Herald’ said:“One of the best races in the programme was the two miles in which JJ Barry of Eire found more than his match in Fred Wilt of the United States. Finishing the first mile in 4 min 32 sec, the Irishman did more than he was accustomed to do by making the pace. Neither he nor Wilt was concerned about the field of handicap runners during the first mile and a half. Then both made substantial progress, and over the last lap the American put in a finish with which the Barry was unable to cope. He as well as the winner was inside the 45 year old record of Alfred Shrubb, the winner by 4.4 sec and Barry by 3 seconds. On Monday evening of 13th June, at Helenvale Park in Glasgow, John Joe ran one and a half miles in 6:33.8 – a world’s best time for the distance. The distance was not recognised as a world record because the distance was not recognised but nevertheless it made the whole athletics world sit up and take notice. The Glasgow Herald athletics correspondent said: “John J Barry the St Machan’s and Clonliffe Harrier (Eire) runner created a new world record for one and a half miles at Helenvale Park last night when at St Machan’s Sports meeting he covered the distance in 6 minutes 33.8 seconds. Barry’s time was 2-10th sec faster than the previous best set by Glenn Cunningham (USA) in 1937 and 2.7 better than the British record set by Tom Riddell (Shettleston Harriers) in 1935. With the Scottish mile and three mile champions J Fleming and A Forbes running from 20 and 25 yards respectively Barry covered the first mile in 4 min 22 sec and had his field well in hand. Round the last lap he put in a superb effort to beat W Lennie (Vale of Leven) to whom he was conceding 85 yards and won by 30 yards.” A world record set in Glasgow in a handicap race at a meeting organised by St Machan’s AC from Lennoxtown. That’s a thing that will never be seen again – and not just because St Machan’s AC is defunct. I’ll say more about the club below. The Scots Athlete devoted two pages to the man after this world record in their June 1949 issue under the headline “A World Record for John Joe Barry” and I quote the article – probably by Emmet Farrell with contributions from Walter Ross. 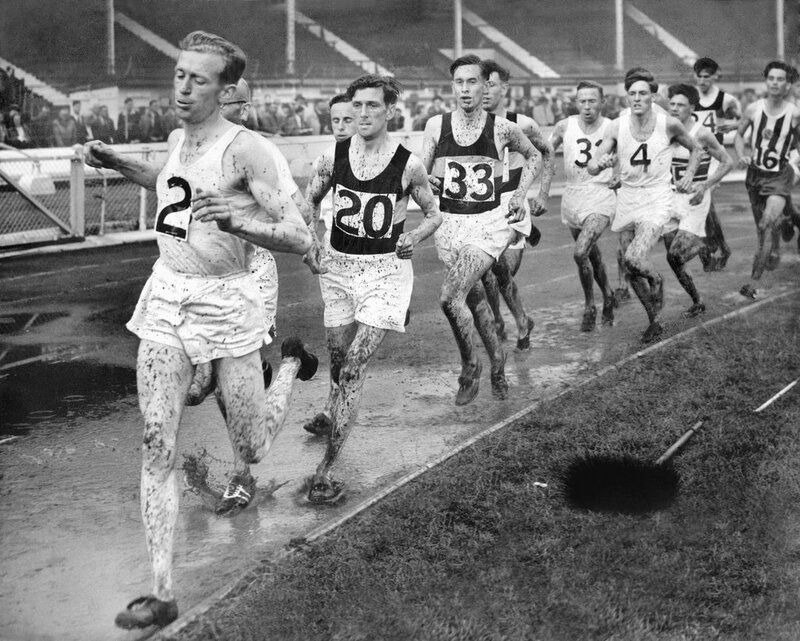 “At Helenvale Park, Glasgow, on Monday 13th June, 1949, the amazing John Joe Barry (St Machan’s AC and Eire) romped one and a half miles in 6 mins 33.8 secs. Though the time will be generally accepted, it will not be ratified as an official world’s record as the one-and-a-half-miles race is not recognised by the IAAF for record purposes. John set out to beat former Scottish Champion Tom Riddell’s British all-comer’s best of 6 mins 36.5 secs made incidentally in 1935 on the same fast and fine Helenvale ground. But the “Ballycurren Hare” was in sparkling form and also beat the previous world’s best of 6 mins 34 secs standing to the name of the great Glenn Cunningham, USA. His lap times were 59.5, 66.5, 67.9, 68.1 (1 mile in 4 mins 22 secs), 67.8 and 64 secs. Many thought that the very fast first lap would foil his attempt but John Joe is athletically a law unto himself. The report by Emmet Farrell in his ‘Running Commentary’ in the Scots Athlete also made a bit more of Forbes’s running than of Barry’s but gave his reason why. “The duel between John Joe Barry and Andy Forbes in the 3 miles was a classic and will be a fragrant memory to those privileges to be present. Forbes in particular ran the race of his life and although losing his title cracked his own native record to the tune of 14 seconds, a remarkable display of powerful and artistic running. It may seem churlish to lavish more praise on the runner-up than the victor. Barry after all came back in magnificent fashion after his disappointing show in the half mile to win the three miles title in gallant fashion despite the reaction caused by his earlier racing and previous heavy programme. He too proved himself a “bonny fechter”. But we knew John Joe was capable of such running. On the other hand, Andrew Forbes surpassed himself. Not only did he bear the heat and burden of the day, by assuming the role of pace maker, but he took John Joe right to the tape, demonstrating an entirely unsuspected brand of finishing power. Despite Barry’s four star display in the 3 miles at Hampden, I had a feeling that he was beginning to feel the strain of his recent terrific programme yet the proof of the pudding is the eating. A few days later the Tipperary man completed the mile at Helenvale Park in the wonderful time of 4 mins 12.1 secs , just 1.1 secs outside Wooderson’s all-comers record of 4 mins 11 secs. Barry lapped in respectively 61, 64, 66 and 61.2 secs. Wooderson in 60, 64, 66 and 61 secs. A remarkable similarity indeed. At the start of September he ran in Belgium over a mile against Willy Slijkhuis of Holland but was beaten by almost four seconds – 4:12.4 to 4:16.0 – and the report on the race in the Scots Athlete ended with the following paragraph: “Unless he changes his mind Barry intends to settle in the USA after appearing in the indoor season early next year, and if so we may see him only on rare occasions if at all. I feel certain that the “Ballycurran Hare” will prove a popular figure over there. Our loss will be America’s gain.” And so it proved – John Joe moved to USA and was the first of many great Irish runners to study and train at Villanova University. Over his career, John Joe Barry won nine Irish track titles, one Irish senior cross country title, one English AAA 3-mile title (1949), one Scottish AAA 3-mile title (1949), and one American indoor mile title in 1950. He won his Irish cross country title as well as an Irish mile and 4-mile title in 1945 with Ballincurry AC. In 1946 he won the 880 yard and mile titles with Civil Service Harriers, in 1948 he won the 880 yard and mile titles with Clonliffe Harriers, and in 1949 he won the 880 yard, mile and 3-mile titles also with Clonliffe Harriers. The St Machan’s club in Lennoxtown was set up by Father Denis O’Connell in a little village under the Campsie Fells just north-east of Glasgow. During his early years in Scotland, Father O’Connell was alarmed at the divide between Catholic and Protestant and set about using athletics as a means to bring the communities closer together. Among his activities was a Community Games where all could come together and he also established the St Machan’s Athletic Club. During his time in Lennoxtown, 1941 to 1949, the club grew steadily with John Joe Barry being an outstanding example to all in the area, not just the athletes. Strangely enough, his departure to Methil in Fife coincided almost exactly with John Joe’s move to USA. He organised sports meetings in Lennoxtown and further afield bringing many of the very best athletes in Scotland to compete there. Father Whelan in Lennoxtown presents John Joe with a trophy: Father O’Connell in the middle. John Joe Barry was the first of many, many famous Irishmen to travel to the United States – he was followed by such as Olympic champion Ron Delany, Eamonn Coughlan, Ray Flynn, Frank Murphy, Noel Carroll and Sonia O’Sullivan. Look him up and read about him. A wonderful runner, a charismatic character and a great role model – we were fortunate that he ran in Scotland and brought out the best in our best men as well as bringing the crowds out to athletic meetings.